We are garden fairies and we have decided to post on this blog because we think Carol is not posting enough these days. She claims to be "busy" whatever that means. We are garden fairies and we don't understand this busy business as an excuse. We are busy all the time. There is no rest for us, between the responsibilities, big responsibilities, we have to make flowers bloom and to keep track of all the goings on here in the garden, there is never a minute to rest. But we have evidence, lots of evidence, that Carol isn't as busy as she claims. Oh yes, we do. But before we go into all that and tell all that is really going on around here, we wanted to make note that certain garden fairies, who shall not be named but they know who they are Wisteria Windingvine, have taken it upon themselves to wind the wisteria vine around the hose out by the veg garden. 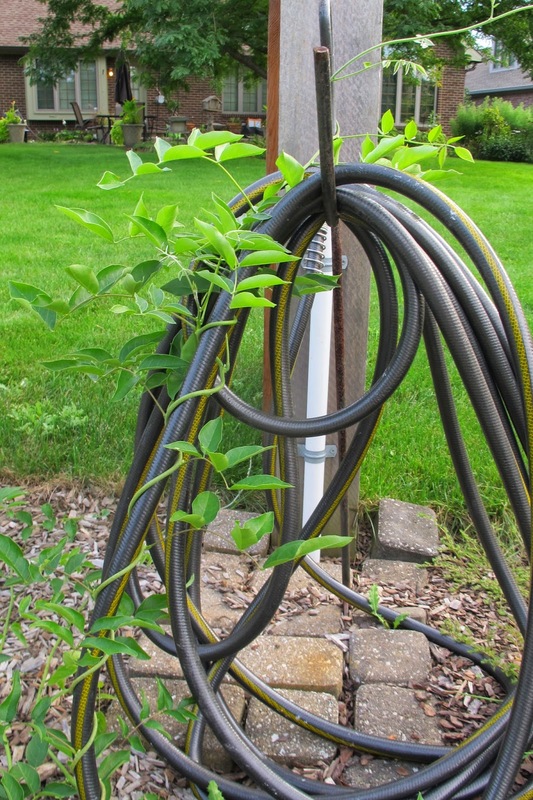 Land sakes, it isn't as though Carol has needed this hose this year. Goodness gracious and butter the bread, we have been getting all kinds of rain this season. It really sometimes is getting in the way of our garden fairy duties and responsibilities, but we will not complain. Not after what we went through a few years back when it was so dry we couldn't squeeze a drop of water out of anything around here. No, we are garden fairies, we are grateful and we are done now with keeping this blog going. It is up to Carol or one of those other lazy people she claims to know to post next. Violet Greenpea Maydreams, the busiest garden fairy you know. Clearly Carol has not been busy watering, or that fairy couldn't have wrapped the wisteria vine around the hose. It was a delightful summer weather-wise. The garden fairies should be happy about that. It's a busy time of year. If only I had a few ambitious garden fairies of my own to post for me! Alas, mine are probably too busy out there encouraging the weeds to grow and leading the slugs to all the most tender garden plants.